Place the carcasses into a vacuum bag along with the celery, bay leaves, carrots and water. Place the bag in the SmartVide and cook for 8 hours at 80ºC (176ºF). Julienne the onions, slice the garlic and brunoise cut the shallots. Place the butter and the oil in a pan and fry the onion, shallot and garlic on a very low heat until the sugar from the vegetables causes them to caramelise. Add the muscatel wine to the caramelised onion to deglaze the pan, cook off the alcohol and add the sopako bread, which has been cut into thin slices. When the consommé is ready, reduce the temperature as quickly as possible. Keep it in the storage chamber until it is needed. When preparing the full recipe, open the bag which contains the consommé and strain it. Place the cooked vegetables and sopako bread into a vacuum bag with 500 ml of the cold chicken consommé. Vacuum seal the bag to 99% and cook it in the Smartvide for 30 minutes at 80ºC (176ºF). Once cooked, pour the soup into a bowl, add salt to taste and place some baguette slices on top of the soup. Cover this bread with Gruyère cheese and place it under the salamander grill to colour. – On the one hand, since the temperature is controlled throughout and it is never allowed to boil, you can make a fairly clarified consommé. – Furthermore, all of the flavours of the vegetables and spices are retained in the bag, meaning that the consommé is more tasty. 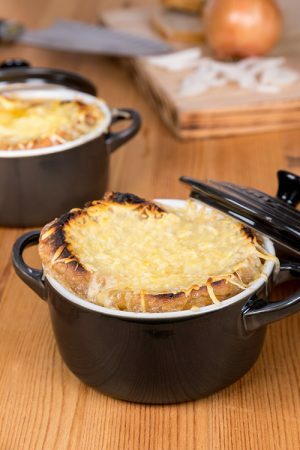 – Finally, keeping the onion soup in the storage chamber in single serving bags means that it can be reheated in the SmartVide as needed.